Holy delicious smoothie bowl sent from the heavens above. Creamy. Crunchy. Sweet. Salty. Perfection! If you follow me on Snapchat or Insta, you know that smoothies are my life both at home and at Alchemy (which is basically home, too). Deeeee-licious, splendidly slurpable nutrition on-the-go! Lately my go-to blend is a cup of frozen blueberries (I always get wild if they’re on sale), a cup of frozen spinach, a cup of unsweetened vanilla almond milk, about half a cup of water, a tablespoon of hemp seeds for creaminess and inflammatory properties, a tablespoon of cacao powder for flavor and loads of antioxidants, a teaspoon of spirulina for nature’s multivitamin, a little knob of ginger to fight inflammation, and a scoop of protein to hold me over (Vega Protein + Greens or chocolate Skoop.) The sweetness comes from the protein powder, so you’ll definitely want to add some banana or dates if you’re not using protein! It sounds like a lot, but I make freezer smoothie bags over the weekend which makes prep a breeze. 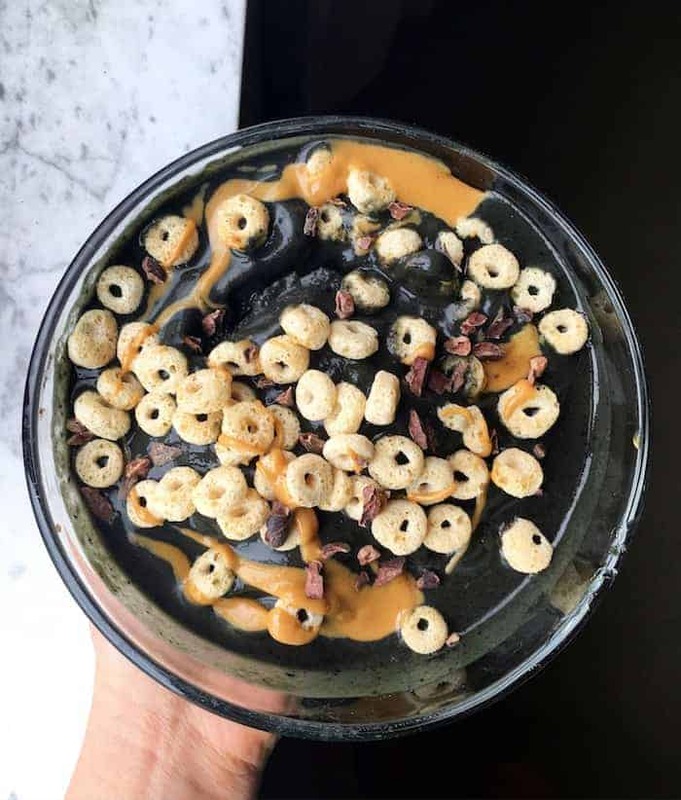 If I have time, I eat it in a bowl topped with Love Grown Power O’s and cacao nibs for crunch plus a drizzle of creamy salted peanut butter. SO GOOD. I also had coffee and a beloved Trilogy kombucha. Thank God we sell them at Alchemy now! Lunch was a salad with mixed greens, baked sweet potatoes, cucumber, tomatoes, radishes, grated carrots, Cleveland Kraut beet sauerkraut (probiotics yasssss! ), dry-roasted edamame, balsamic vinegar, olive oil, salt, pepper, and garlic powder.. One of the first things I tell my nutrition counseling clients is to try a smoothie for breakfast and a loaded salad with some kind of plant protein for lunch at least twice a week. It’s a great habit to get into! Healthy eating has so, so much to do with behavior change. 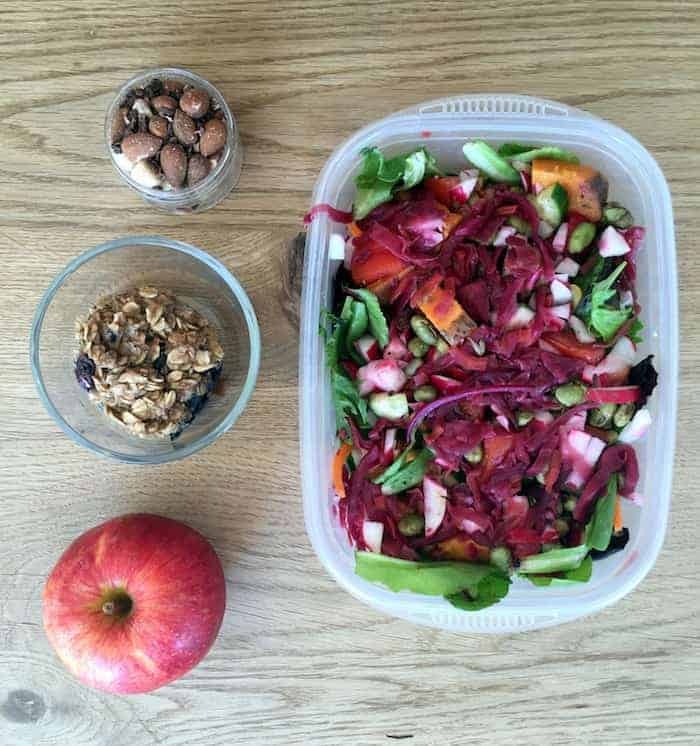 Making smoothie bags and salads isn’t hard—it just may be a change! On the side was a Zucchini Banana Oatmeal Cup with fresh bloobs added, an organic Fuji apple, and the cutest little container of Power O’s, cacao nibs, and almonds. Can you even?! 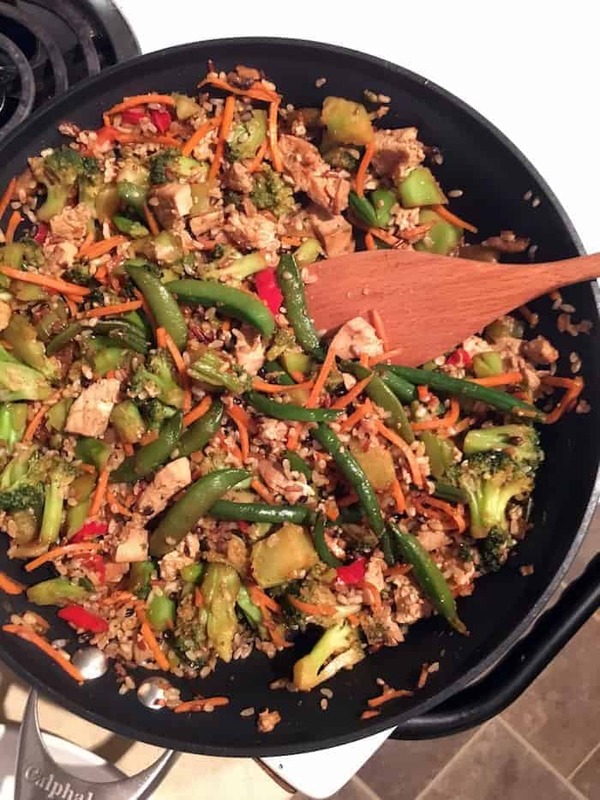 Dinner was a quick version of my Easy Vegetable Teriyaki Stir Fry. I pressed a block of tofu, chopped it up, and marinated it in a mix of low-sodium tamari, ginger, and Trader Joe’s Island Soyaki Sauce. When I got home from work, I baked it at 350F for about half an hour. Meanwhile, I sautéed a package of defrosted frozen stir fry veggies, a bag of frozen broccoli florets, and some shredded carrots in olive oil. Once it was cooked, I added a cooked bag of TJ’s frozen brown rice medley, the cooked tofu, and more tamari, Island Soyaki sauce, and sriarcha. The chicken-lovin’ boyf ate a huge serving. If you’re looking for other veg meals to please boyfriends or husbands, he also loves this lasagna, these enchiladas (you can used canned beans instead of lentils), this tempeh casserole, and quinoa fried rice. I couldn’t end the night without some super dark Lindt chocolate. Wishing you the happiest of Wednesdays! I love that you mentioned it is behavior change that helps lead to dietary habits changing, so true! Small changes over time can lead to major success! Happy WIAW! There s so much goodness in that smoothie bowl! I just gotta buy more bloobs and I’ll be making this! Your smoothie sounds delicious! I must try that blend. Hi there-another great WIAW! I have been adding maca powder to my smoothies lately, is that something you would recommend? Is it safe to use? I try and have a salad every day for lunch, too. Such a great way to incorporate a ton of ingredients and nutrients! 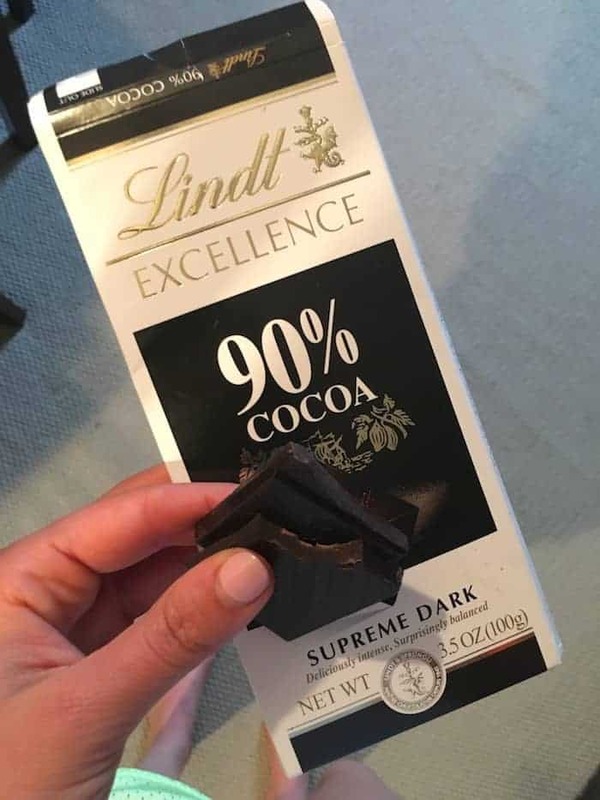 I love that 90% chocolate; it’s so buttery! Love my lunch time salads, especially in the summer! I can’t believe I just came to your blog, but I loved the Food Entrepeneur Summit for inspiring us with amazing business owners like you Alexis. All of this food looks really good, especially that pretty smoothie bowl. I’ve tried a few smoothie bowls, but mine are … pretty blah looking. They do taste good though. 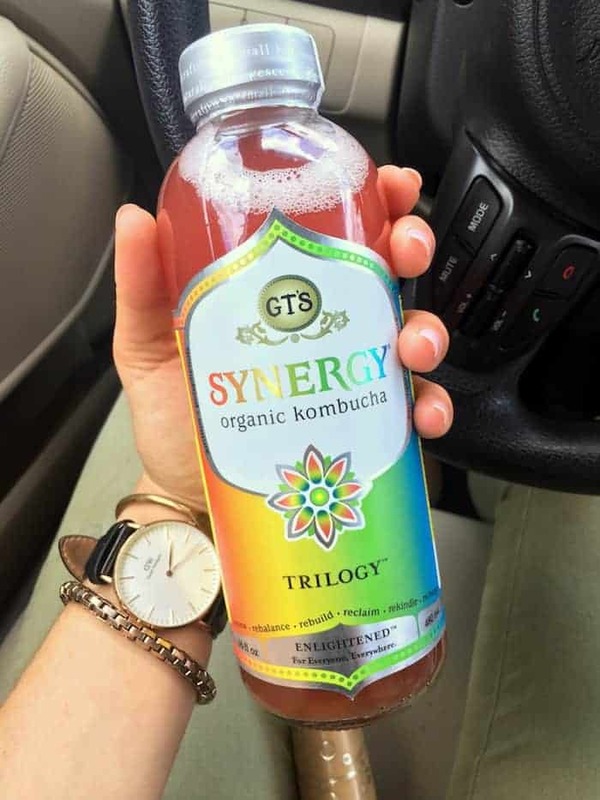 Do you sell kombucha and juice at Alchemy? I’m so glad you found me! Mine are usually ugly too because I add spirulina :) Yes we sell cold-pressed juice that we make on site and kombucha, too. Check out our menu at alchemyjuicecafe.com! wonderful, i’m totally trying one of these, that chocolate though!